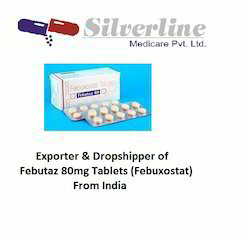 Being perfectly shaped and swift movement of our organization, we are instrumental in offering Febutaz (Febuxostat) Tablets. 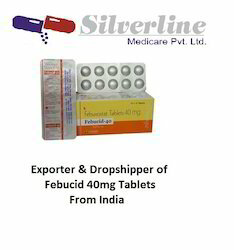 The Febutaz tablet provided by us is rigorously tested on diverse parameters in order to assure its pure range. 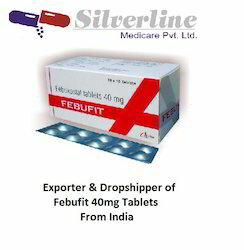 Offered Febutaz tablet treats gout by reducing serum uric acid levels. It is classified as a xanthine oxidase inhibitor. 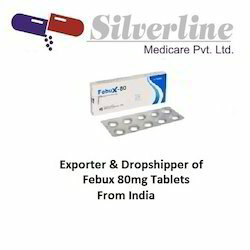 This Febutaz tablet is well processed from the supreme class ingredients and latest processing methodology under the direction of vendor’s experts. 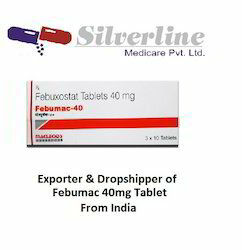 Uses Febutaz (Febuxostat) treats gout by reducing serum uric acid levels. It is classified as a xanthine oxidase inhibitor. Gout occurs due to hyperuricemia, which causes abnormally high blood uric acid levels. Crystals may be formed in the joints from this uric acid, resulting in sudden and extreme pain that is accompanied by swelling and stiffness. Treatment with this medicine aims to manage and prevent gout (but not to treat flare-ups). Its mechanism of action is blocking xanthine oxidase activity (the enzyme that produces uric acid), which causes a decrease in uric acid levels, thereby helping to prevent the occurrence of gout attacks. 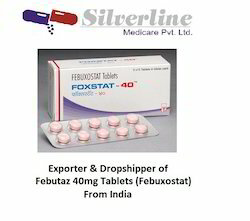 Dosage and Administration Febutaz (Febuxostat) is available as 40mg, 80mg and 120mg strength tablets for oral administration. Physicians generally instruct adult patients treating gout to administer 40mg once per day as a starting dosage. This may be adjusted on the order of the physician, to a maintenance dosage of 80mg per day. However, it is also possible that the dosage will not be adjusted for maintenance treatment. There is a chance that this medicine may cause a gout attack after treatment has commenced, and your physician may recommend taking other medicines to relieve the pain. Eventually, when the uric acid levels are effectively reduced, the occurrence of gout attacks will decline. Febuxostat, a xanthine-oxidase inhibitor, is indicated for the treatment of gout. 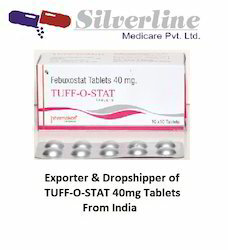 Febuxostat lowers the plasma uric acid levels and prevents acute gout attacks. However, the drug is not useful once the symptoms occur. 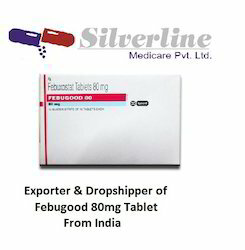 FEBUGET (Febuxostat) is prescribed to reduce production of uric acid in order to prevent and manage conditions like as kidney stones or gout. Left untreated a building up of excessive uric acid leads to these conditions. This medication may be prescribed either alone, or in addition to another medication to treat your condition. 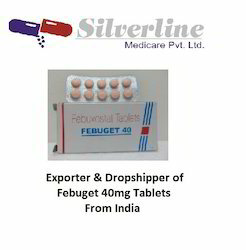 Febuget (Febuxostat) is prescribed to help prevent and manage conditions such as kidney stones and gout by impairing uric acid production. When an excessive amount of uric acid builds up and is left untreated, more serious health conditions can easily occur. It can be used either alone, or in combination with other medication to achieve the best results. 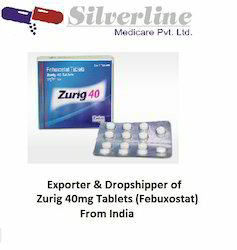 Strictly use Zurig (Febuxostat) as you have been prescribed by your physician. Correct dosages can vary depending on the patient and their condition. If you are not certain about how to take this medication, always consult your physician or pharmacist. Most patients are prescribed a dose of 40mg taken once daily. Your physician will adjust your dosage based on your progress. Always attend any appointments to make sure the correct alterations are made. The following side effects are more serious and require medical attention as soon as possible. Seek immediate medical attention if you think you are suffering an allergic reaction. Possible symptoms include skin rashes, hives, swelling, chest pains, difficulty swallowing, and trouble breathing. Febuxostat is a xanthine oxidase inhibitor used for treating gout caused by excessive levels of uric acid in the blood (hyperuricemia). Uric acid is formed from the breakdown of certain chemicals (purines) in the body. Hyperuricemia occurs when the body produces more uric acid than it can eliminate. The uric acid forms crystals in joints (gouty arthritis) and tissues, causing inflammation and pain. Elevated blood uric acid levels also can cause kidney disease and kidney stones. Febuxostat prevents the production of uric acid by blocking the activity of the enzyme (xanthine oxidase) that converts purines to uric acid. Uric acid levels may fall to target treatment levels within two weeks. 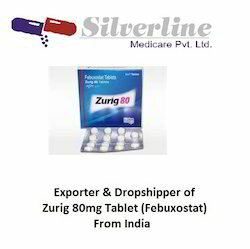 Febuxostat and allopurinol(Zyloprim) are similar in how they work, but the maximum dose of febuxostat is more effective in reducing uric acid levels. Zurig 80 works by decreasing the amount of uric acid that is produced by the body and prevents uric acid build up. The active ingredient febuxostat is classified as a xanthine oxidase inhibitors type of medication. By preventing uric acid build up, it will prevent gout attacks causing pain, swelling, redness and inflammation in one or more joints. The medication is used as a long term treatment to prevent gout attacks but cannot be used to treat them once they occur. How is Zurig 80 used? Zurig 80 should be taken orally as directed by a doctor, usually once per day. To reduce the risk of side effects, the tablets should be taken with or immediately after a meal along with a full glass of water. Contact a doctor for the correct dosage and length of treatment as it will depend on the patient?? ?s condition and their reaction to the medication. Other medications may be prescribed along with this treatment for the first few months as the risk of gout attacks increases when the excess uric acid is being removed from the body. Zurig 80 is not always suitable for all patients. Always consult your health care provider prior to using this medication if you are pregnant, breastfeeding, trying to conceive, using any other medication (prescription or non-prescription), using any herbal products or supplements, or if you have any allergies or other health problems. Precautions: History of liver diseases, kidney diseases, chest pain, cancer, stroke, elderly, children, pregnancy, and breastfeeding. Caution should be exercised in patients who have undergone organ transplantation (kidney, liver, heart and lung). If condition worsens, stop the medication immediately. Side Effects: Swelling in the face, lips, tongue or throat regions, sweating, general illness and loss of appetite, skin allergic reactions, difficulty in breathing, chest pain and heaviness in the chest region, nausea and stomach pain, headache and confusion, vision problems, Anemia, pain, swelling in the joint regions, stroke and inflammation of liver. Contraindications: Severe renal impairment, Severe liver impairment. Storage Conditions: Store it at room temperature and Keep away from light and children. This may not be a complete list of all interactions that may occur. Ask your health care provider if febuxostat may interact with other medicines that you take. Check with your health care provider before you start, stop, or change the dose of any medicine. 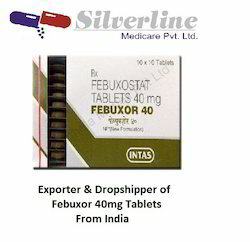 Febuxostat is used to treat painful joint condition (gout) and increased blood uric acid levels (hyperuricemia).Febuxostat belongs to a class of medications called xanthine oxidase inhibitors. It works by decreasing the amount of uric acid in the body and thereby preventing gout attacks. Fabulas (Febuxostat) treats gout by reducing serum uric acid levels. It is classified as a xanthine oxidase inhibitor. Fabulas (Febuxostat) treats gout by reducing serum uric acid levels. It is classified as a xanthine oxidase inhibitor. Gout occurs due to hyperuricemia, which causes abnormally high blood uric acid levels. Crystals may be formed in the joints from this uric acid, resulting in sudden and extreme pain that is accompanied by swelling and stiffness. Treatment with this medicine aims to manage and prevent gout (but not to treat flare-ups). Its mechanism of action is blocking xanthine oxidase activity (the enzyme that produces uric acid), which causes a decrease in uric acid levels, thereby helping to prevent the occurrence of gout attacks. 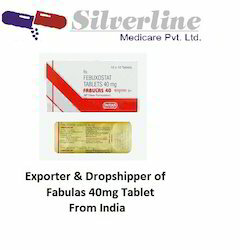 Fabulas (Febuxostat) is available as 40mg, 80mg and 120mg strength tablets for oral administration. Physicians generally instruct adult patients treating gout to administer 40mg once per day as a starting dosage. This may be adjusted on the order of the physician, to a maintenance dosage of 80mg per day. However, it is also possible that the dosage will not be adjusted for maintenance treatment. 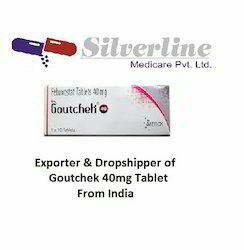 There is a chance that this medicine may cause a gout attack after treatment has commenced, and your physician may recommend taking other medicines to relieve the pain. Eventually, when the uric acid levels are effectively reduced, the occurrence of gout attacks will decline. Other reactions are also possible. You will require immediate medical treatment or a visit to the hospital if you notice numbness, speech problems, perspiration, fainting, difficulty balancing or any other severe adverse events that have not been referenced here. 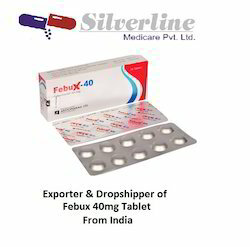 Fabulas (Febuxostat) is not used to treat acute gout attacks or flare ups, as it is not suitable for this purpose. It is only intended for the prevention and control of symptoms. Another medicine may be recommended by your physician to treat flare ups. Patients will be required to undergo blood tests to assess the function of their liver before and during the course of treatment. If you become dizzy as a result of taking this medicine, or if you suffer from drowsiness, do not drive or use machinery, as doing so is extremely hazardous. Febuwel, a xanthine-oxidase inhibitor, is indicated for the treatment of gout. 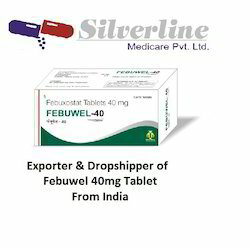 Febuwel lowers the plasma uric acid levels and prevents acute gout attacks. However, the drug is not useful once the symptoms occur. 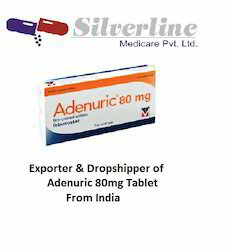 This medication is a xanthine oxidase (XO) inhibitor, prescribed for gout and hyperuricemia (high level of uric acid in blood). 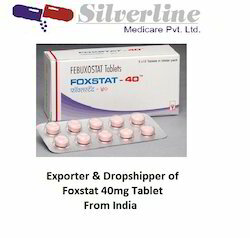 It decreases the amount of uric acid in blood.Febuxostat lowers uric acid. PO- The recommended dose is 40 to 80mg, once daily. How it should be taken : It comes as a tablet to take by mouth with or without food.Upset stomach or throwing up. Many small meals, good mouth care, sucking hard, sugar-free candy, or chewing sugar-free gum may help. - Joint pain. Take a missed dose as soon as you think about it. If it is close to the time for your next dose, skip the missed dose and go back to your normal time. Do not take 2 doses at the same time or extra doses. Do not change the dose or stop this drug. Talk with the doctor.If you have an allergy to febuxostat or any other part of this drug. - Tell your doctor if you are allergic to any drugs. Make sure to tell about the allergy and what signs you had. This includes telling about rash; hives; itching; shortness of breath; wheezing; cough; swelling of face, lips, tongue, or throat; or any other signs. Long-term treatment of high blood uric acid levels in patients with gout. Febuxostat is a xanthine oxidase inhibitor. It works by blocking an enzyme in the body (xanthine oxidase), which lowers levels of uric acid in the blood. This helps to prevent gout flare-ups. Fabulas with the active ingredient febuxostat is classified as a xanthine oxidase inhibitor used to prevent acute gout attacks. Gout occurs when there is a high level of uric acid in the bloodstream that builds up in the joints causing attacks of inflammation, redness and pain. The medication works by decreasing the amount of uric acid produced by the body to prevent the build up in the joints. Fabulas should be taken orally as directed by a doctor, usually once each day. The tablets can be taken with or without food but should be taken with plenty of water. Dosage will depend on the patient?? ?s condition and their reaction to the medication, contact a doctor for the correct dosage. Your doctor may order regular blood testing to test your uric acid levels. The treatment can be used to prevent gout attacks but cannot be used to treat them once they occur. Fabulas is not always suitable for all patients. Always consult your health care provider prior to using this medication if you are pregnant, breastfeeding, trying to conceive, using any other medication (prescription or non-prescription), using any herbal products or supplements, or if you have any allergies or other health problems. Treatment of chronic hyperuricemia in conditions where urate deposition has already occurred (including a history, or presence of tophus and /or gouty arthritis). For treatment of hyperuricemia in patients with gout, Febuxostat is recommended at 40 mg or 80 mg once daily. 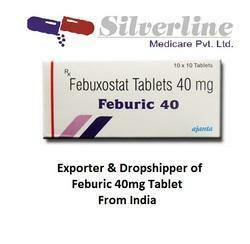 The recommended starting dose of febuxostat is 40mg daily. For patients who do not achieve reduction in serum uric acid less than 6mg/dl after 2 weeks with 40 mg, febuxostat 80mg is recommended. Febuxostat can be taken without regard to food or antacid use. Gout Flare: After initiation of Febuxostat, an increase in gout flares is frequently observed. In order to prevent gout flares when Febuxostat is initiated, concurrent prophylactic treatment with an NSAID or is recommended.Cardiovascular Events: In clinical studies, there was a higher rate of cardiovascular thromboembolic events (cardiovascular deaths, non-fatal myocardial infarctions, and non-fatal strokes) in patients treated with Febuxostat but causal relationship with Febuxostat has not been established. Monitor for signs and symptoms of myocardial infarction (MI) and stroke. 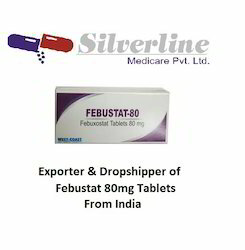 Hepatic Effects: There have been reports of fatal and non-fatal hepatic failure in patients taking Febuxostat, although the reports contain insufficient information necessary to establish the probable cause. During clinical studies, transaminase elevations greater than three times the upper limit of normal (ULN) were observed. Zurig 80 should be taken orally as directed by a doctor, usually once per day. To reduce the risk of side effects, the tablets should be taken with or immediately after a meal along with a full glass of water. Contact a doctor for the correct dosage and length of treatment as it will depend on the patients condition and their reaction to the medication. Other medications may be prescribed along with this treatment for the first few months as the risk of gout attacks increases when the excess uric acid is being removed from the body. 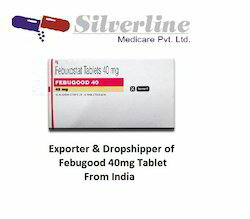 If you have an allergy to febuxostat or any other part of this drug. - Tell your doctor if you are allergic to any drugs. Make sure to tell about the allergy and what signs you had. This includes telling about rash; hives; itching; shortness of breath; wheezing; cough; swelling of face, lips, tongue, or throat; or any other signs. Uloric (febuxostat) is a xanthine oxidase inhibitor used to treat excess uric acid in the blood (hyperuricemia) in patients with gout. 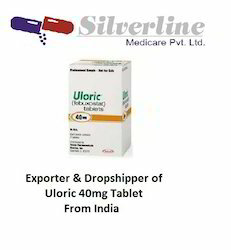 Side effects of Uloric include joint pain/swelling/stiffness, nausea, skin rash, and dizziness. 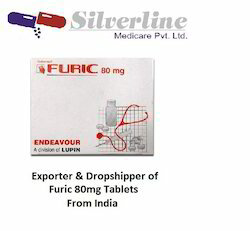 Uloric (febuxostat) is available in tablets in strengths of 40 or 80 mg. Starting dosage is usually 40mg once daily. Serious side effects include cardiovascular events including myocardial infarction, liver enzyme abnormalities, weakness, numbness in extremities and shortness of breath. Uloric should not be used in patients treated with or mercaptopurine. Use in pregnancy would have to outweigh risks to the fetus as such studies, including the presence of Uloric in breast milk of humans, has not been done. Safety and effectiveness in pediatric patients,18 years of age or less have not been done. Our Uloric Side Effects Drug Center provides a comprehensive view of available drug information on the potential side effects when taking this medication. 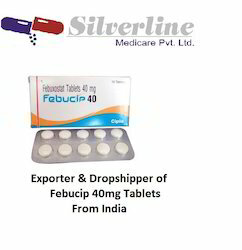 Febucip Tablet is a medicine that is used for the treatment of Painful Joint Conditions, High Blood Uric Acid and other conditions.Febucip Tablet contains Febuxostat as an active ingredient.Febucip Tablet works by reducing the level of uric acid, thus prevent gout attacks.Detailed information related to Febucip Tablet's uses, composition, dosage, side effects and reviews is listed below. 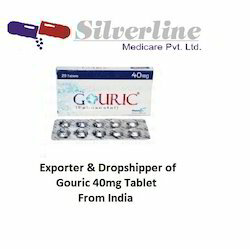 This medication is a xanthine oxidase (XO) inhibitor, prescribed for gout and hyperuricemia (high level of uric acid in blood). It decreases the amount of uric acid in blood. PO- The recommended dose is 40 to 80mg, once daily. How it should be taken : It comes as a tablet to take by mouth with or without food. 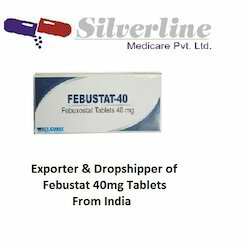 We are the Leading suppliers of Febustat. 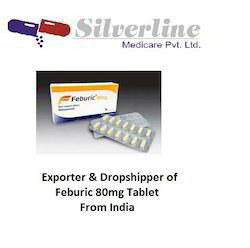 We also do Drop Shipping of Febustat. 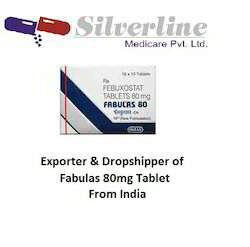 We are the Leading suppliers of Fabulas 80mg Tablet. 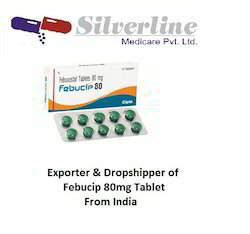 We also do Drop Shipping of Fabulas 80mg Tablet. 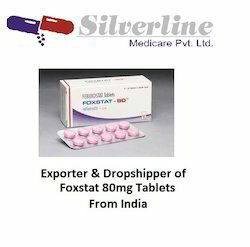 Looking for Febuxostat Tablets ?